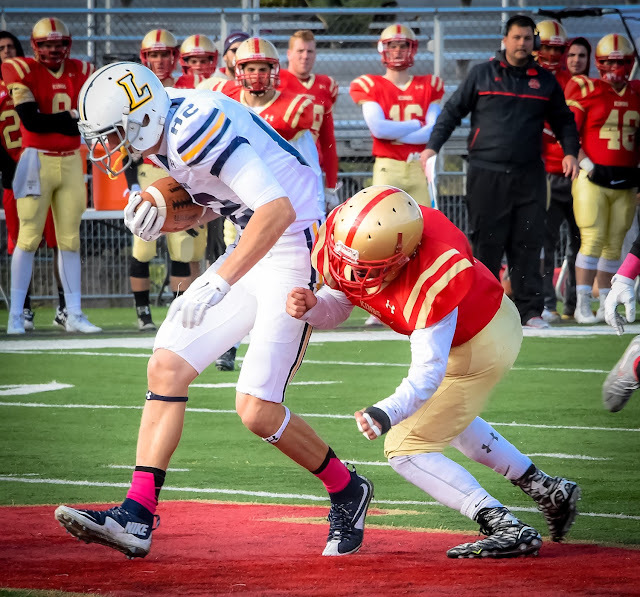 Flashback October 17, 2015 - #82 Fr WR Nick Costello with a 19 yard catch and comeback try by Lycoming against King's. I had to take these photos (CLICK HERE TO VIEW) and I felt so bad for him. Let me pull from my memory and set up the events that took place that day. 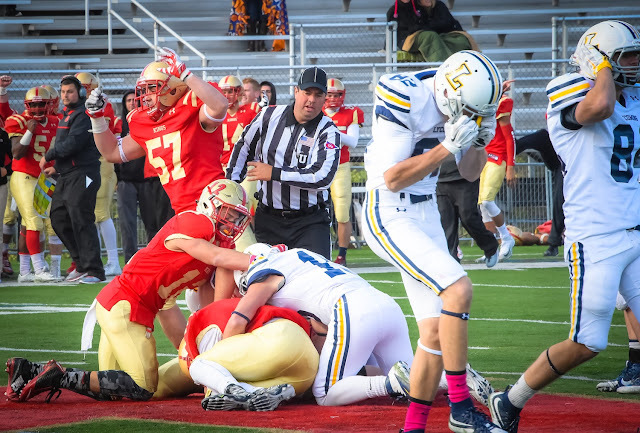 Flashback October 17, 2015 - Costello reacts to the hard hit and fumble that stopped the Warriors in their tracks. 4th Quarter: Lycoming leads King's 26-24 with six minutes on the clock. King's uses up over five minutes of the clock and scores with 52 seconds in the game. King's misses the extra point. Lycoming is now trails the Monarchs, 30-26. After the kickoff, that was returned to the Warrior 37 yard line, Lycoming come to the line of scrimmage ready for their two minute drill, but under a minute to go. Passing was at the top of the coaches playlist. QB Chase Whitman comes over the ball, receives the football from the center and takes three steps into the backfield. He spots freshman wide receiver #82 Nick Costello wide open over the middle. The throw is on target as Costello pulls down the ball for a 19 yard gain. But as Costello turns downfield he is hit so hard, the ball squirts out of his hands and is recovered by King's defense. Just like that, the comeback win the Warriors were hoping for is ended by the Monarchs. Flashback October 17, 2015 - The weight of the whole team on his shoulders! As I debated whether to take this photo, I decided to because of the emotion of the game. I knew that someday before Nick Costello was a graduate, I would share this photo sequence. Today is that day! 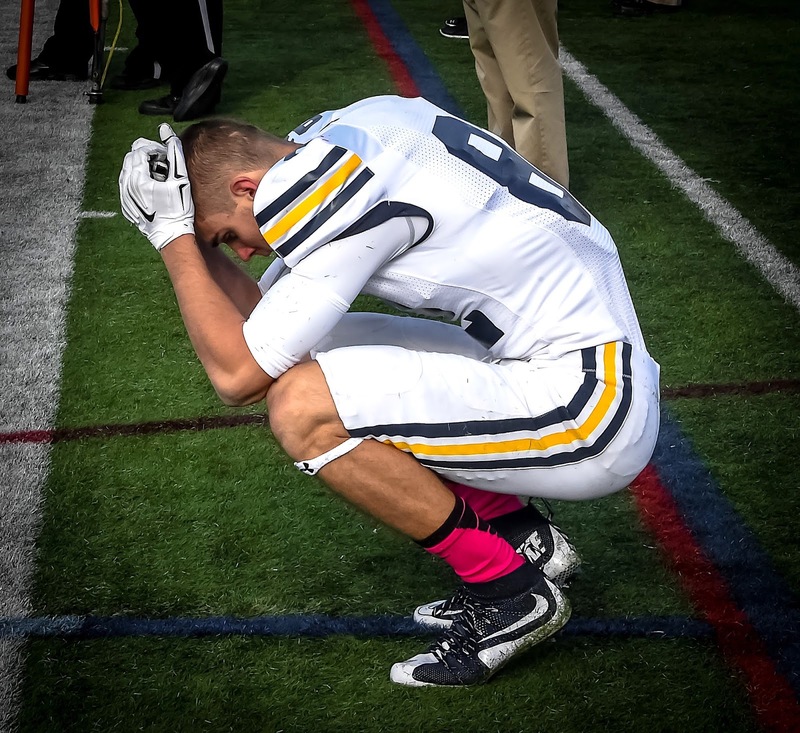 What can you say to a freshman who gave it his all and came up short. The weight of his teammates he has taken on his shoulders. He was a freshman who said to himself, get the ball to me and I will catch it! And he did just that! Well as I remember, and I am old you know, I went over to him and told him, "Shake it off, you will be one of the best wide receivers that Lycoming has ever had!" Now I hope I am not thinking straight and I said that, but that is my memory at this time. If I didn't say it to him personally, I was surely thinking it in my mind. A fantastic catch from team captain and Sr WR Nick Costello putting the Warriors ahead for good against undefeated FDU-Florham last Saturday. This is the magic and aggravation of this great game called football. As the ABC Sports tagline would say, "The thrill of victory and the agony of defeat! So let's move on to 2018 as #12 Sr WR and team captain Nick Costello has progressed. He is one of the best Lycoming has ever had for sure. And he is moving up in the record books quickly. Against FDU-Florham this past weekend, Nick had seven receptions, a career-high 145 yards and two touchdowns which lifted the Lyco football team to a 27-21 win. Lastly, Costello has moved into fifth place in school history with 20 receiving touchdowns. Who knows where he will end up at season's end. One thing is for sure, Captain Nick is a quiet, confident battler who can change a game with one catch above that 6'5" frame of his. 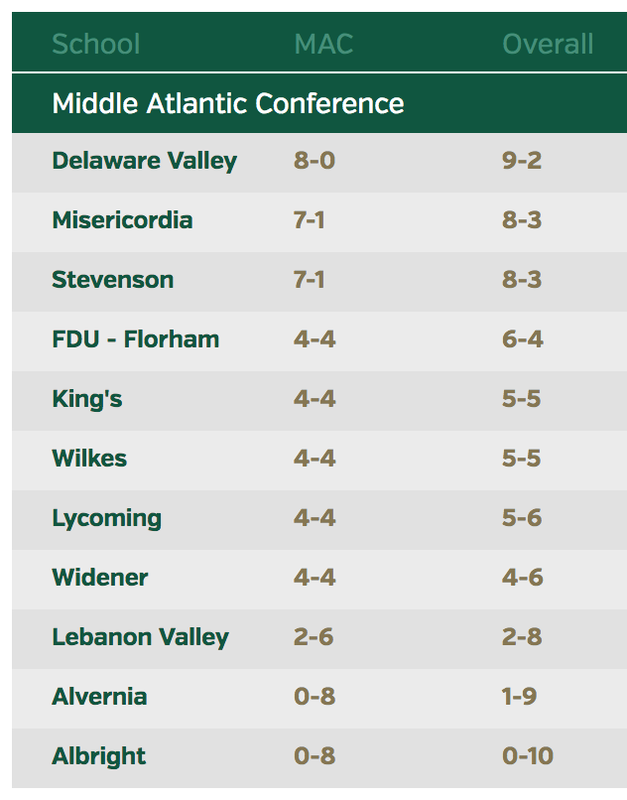 And would you believe, King's is coming to Williamsport Saturday. It should be an exciting game. We can't wait! Hope to see you there.